Treasure Island Hotel and Casino has taken the "wow" factor to new heights with its swanky High Roller Lounge. It's a completely indulgent experience for all who enter. You're sure to get your game on at any of the four blackjack tables or three mini baccarat tables with a $100 minimum to anywhere from $5,000 to $15,000 limits. We've thought of all the comforts anyone could ever ask for in a chic Las Vegas casino. Guests of the High Roller Lounge will enjoy a sophisticated bar with a very attentive staff and a sound system all its own. You'll have the benefit of privacy with curtains to create your own little hideaway. And a private bathroom is a luxurious convenience that will be available only to you. Designed for the ultimate in comfort and luxury, you'll find the ambiance is fantastic and the action is even better at the High Roller Lounge. Indulge your playful side at Treasure Island's lively casino and experience Las Vegas' most popular recreation at its finest! Pull the handle. Roll the dice. Activate exhilaration! Cruising a casino has never been so rewarding. 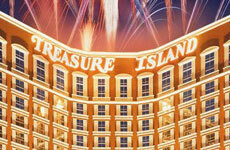 Of all Las Vegas Hotel's and casinos, none compares to Treasure Island's winning style. 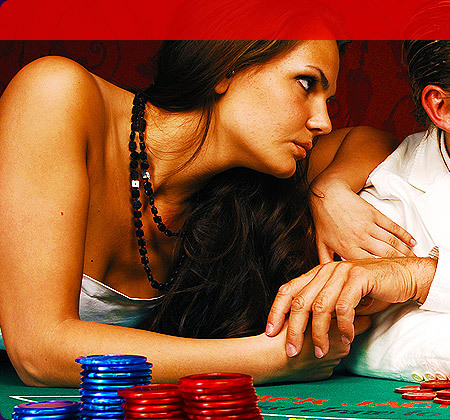 From slots to table games to race & sports book betting, you'll hit on the hottest casino action in town 24/7. Other Poker games may be available upon request. 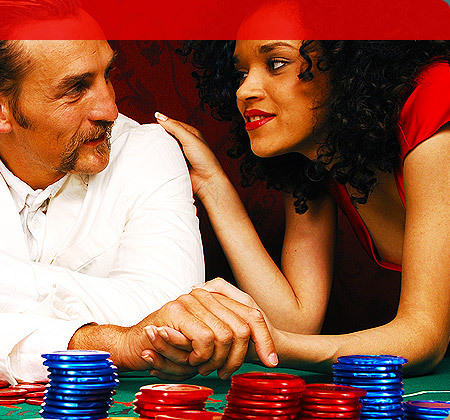 Try your hand at the table gaming classics such as blackjack, roulette, craps, and baccarat or explore innovative new options like Pai Gow Poker, Pai Gow Tiles, Three-Card Poker, Let it Ride® Stud Poker, and Big Six. Treasure Island offers a generous selection of challenging table games for seasoned players, as well as non-intimidating choices for newcomers. Friendly dealers and a distinguished atmosphere will enhance this rewarding experience. Join the Players Club and experience the benefits of playing and earning rewards at twelve more of the world's finest resorts and casinos - all within the MGM MIRAGE™ family. Go for an exhilarating spin with the latest and greatest slot games! 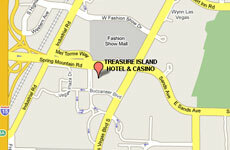 Treasure Island offers an enticing variety of slots that will leave you reeling. Discover your favorites on the elegant casino floor, which is intimate in size, allowing you the exciting opportunity to progress from one machine to another with ease. Get off the sidelines. Be a sport. Score some CASH! Treasure Island's Race and Sports Book is the place to hang for viewing and wagering on the hottest games of the season. Accelerate to Treasure Island's action-packed Race and Sports Book and enjoy fast-paced energy paired with fantastic winnings! The Race and Sports Book is the perfect location to take in your favorite sporting events with friends while wagering for outstanding jackpots. Check out this hot spot for yourself and score some fun and cash!